Gartner Critical Capabilities for Software Test Automation Jim Scheibmeir, Thomas E. Murphy, Joachim Herschmann, December 18, 2018. We believe that Critical Capabilities for Software Test Automation 2018 helps application leaders to understand what’s needed to transform software for Agile and DevOps—with a focus on the role of Continuous Testing, SAP testing, and end-to-end testing across packaged apps, UI, APIs, mobile, and more. 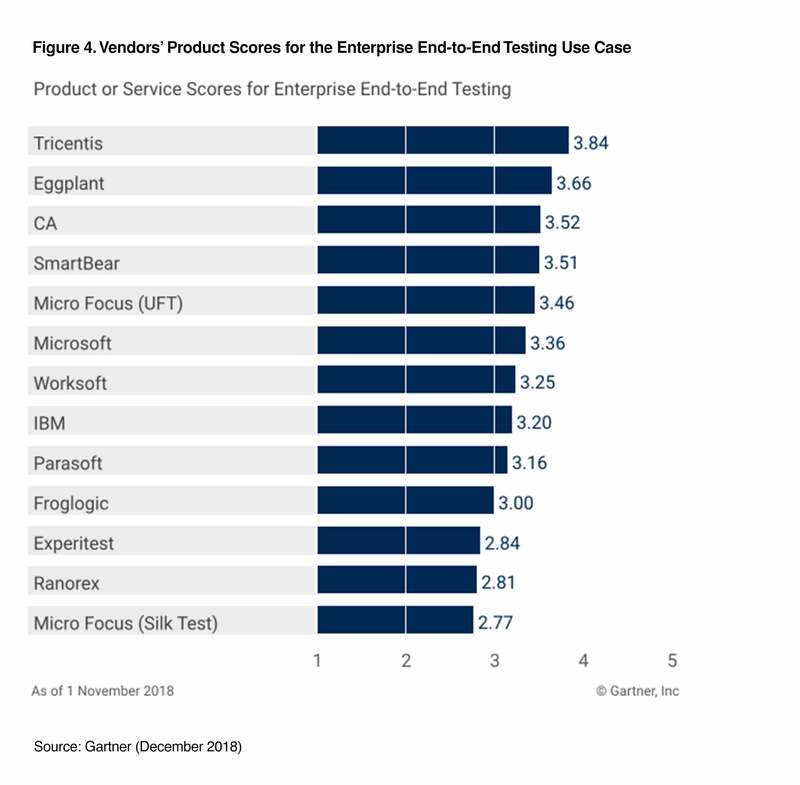 Gartner’s insights on “enterprise end-to-end testing”: the ability to test across all layers of an application such as web or mobile device front ends, business logic layers (e.g., SAP), APIs, and cloud services components within a single console. Disclaimer: Gartner Critical Capabilities for Software Test Automation, Jim Scheibmeir, Joachim Herschmann, Thomas E. Murphy, 18 December 2018. This graphic was published by Gartner, Inc. as part of a larger research document and should be evaluated in the context of the entire document. The Gartner document is available upon request from Tricentis. Gartner does not endorse any vendor, product or service depicted in its research publications, and does not advise technology users to select only those vendors with the highest ratings or other designation. Gartner research publications consist of the opinions of Gartner’s research organization and should not be construed as statements of fact. Gartner disclaims all warranties, expressed or implied, with respect to this research, including any warranties of merchantability or fitness for a particular purpose.